CHINA'S worst summer of power cuts since 2004 threatens to disrupt the economy and add to inflationary pressures. Summer power shortages are a regular occurrence in the world's second-largest economy, but a number of provinces, led by the business powerhouse, Shanghai, have introduced rationing for industrial users. As authorities have been working hard to cool an economy still growing at 9.7 per cent annually, some economists have argued a power shortage could actually be a good thing as it will curtail the country's industrial output. "But it is also possibly inflationary, as it causes supply disruptions for certain goods, as well as creating pressure for electricity prices to rise," Silk Road Economy consultancy managing director Ben Simpfendorfer said. 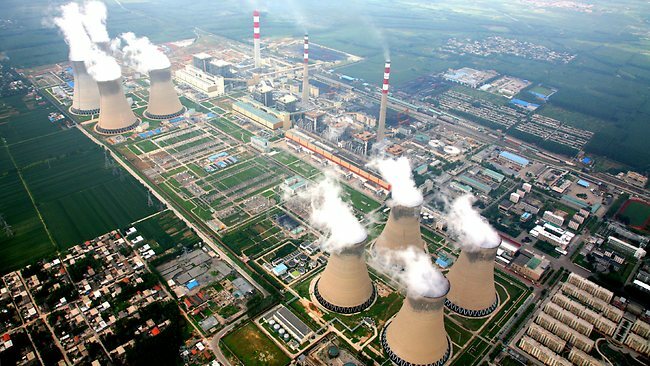 China Electricity Council statistics released this week show that coal-fired power plants operated by the country's five major power generation groups -- China Huaneng Group, China Datang , China Guodian , China Huadian and China Power Investment -- lost 12.16 billion yuan ($1.77 bn) in the first five months of this year, 7.86bn yuan more than in the same period last year. Last month alone, they lost 1.69bn yuan. The big five power companies produce 50 per cent of China's power, with other state-owned entities providing another 45 per cent. This is the conundrum the power companies face: the more power they produce, the more money they lose. China's coal-fired power plants are running at abut 60 per cent of capacity, a figure that is about par with the long-term average but an increase on the past few years. Power prices are controlled by the central government but coal prices depend on the market. The key reason behind the central government's inability to control the price of coal is that China has moved from being a self-sufficient coal producer to a net importer of coal. Despite probably the world's best efforts to crank up alternative power sources -- hydroelectricity is the second biggest contributor as well as nuclear, wind and solar -- China still relies on coal-fired plants for 80 per cent of its power. Growth in hydro power has collapsed this year due the long drought in the middle and lower reaches of the country's central waterway, the Yangtze River. As well, coal prices are high, in part due to the flooding in Queensland and also due to rising demand for electricity, which is up 13 per cent this year. "There are a number of reasons behind the power shortage, including strong demand from energy-intensive sectors," a Citigroup report says. "But more fundamentally, power producers lack the incentive to generate more electricity because rising coal prices and fixed tariffs are eating into their profitability. "A tariff increase would be an integral part of the solution for power shortage." Chinese authorities have already increased prices in two tranches -- each targeting a different group of provinces -- nationally in the past three months. In addition to power shortages, the persistent Yangtze drought and flooding on the east coast this week are increasing inflationary pressure. "The incentives for exaggeration of the power shortage come from industrial players that intend to put pressure on the government for hiking tariffs and for capex allocation." Overall damage to economic growth appears to be limited, but the outages are also posing risks and benefits to a number of sectors, particularly aluminium and cement. "We think the continuation of power shortages would be net positive for cement producers," a Macquarie analyst said. "Further power cuts in the eastern and central areas would give producers another reason to raise prices further, something the market has not factored in." Macquarie analysts also said the shortages were likely to affect earnings at Chalco, the listed aluminum smelting subsidiary of Rio Tinto's largest shareholder. "We estimate Chalco's earnings should change by 7-8 per cent for every 1 per cent change in electricity tariff, due to the company's thin margin and high electricity contribution to total cost," Macquarie analysts said in a note to clients. "Chalco's electricity price has already been rising faster than expected, with its first-quarter electricity tariff 7 per cent higher than the 2010 average. "As we expect further electricity cost inflation while aluminium prices should be capped by high inventory levels in LME, we see Chalco's earnings at risk. "We have recently met with the company, and the company said its margins are very thin even in the second quarter at aluminium prices above $US2500-&US2600 a tonne, which was concerning." But the push and pull between government price setting and power company losses could yet come back to bite, with investment in the sector going backwards last year. "To prevent power shortages from constraining output, the government will have to raise the electricity tariff to reduce demand and increase supply. Based on our estimate, a tariff increase of 4 per cent to 5 per cent would be needed just to cover the loss of the thermal power generation business," Citi said. This is unlikely to happen until inflation begins to fall -- and that may not be for another two months. But the bank warned that the gap between consumption growth and capacity growth could "exhaust the current excess capacity in about three years". China would then face power shortages due to insufficient capacity, which would bring with it very real economic problems, the analyst said. Pocket-sized particle accelerators like EMMA -- the Electron Model of Many Applications -- could bring safer nuclear power to neighborhoods. Two Chinese banks are providing as much as $10 billion in funding to a group of three Chinese makers of solar equipment to build sun-powered energy projects in Europe. China Merchants Bank Co. and the state-owned China Development Bank Corp. are backing the efforts of Goldpoly New Energy Holdings Ltd., TBEA SunOasis Co. and China Technology Development Group Corp. (CTDC) to expand in Europe, CTDC said in a statement. The solar companies say their goals align with the Chinese government’s policies on promoting renewable energy, and that the German government’s plans to abandon nuclear power by 2022 will drive up demand for solar energy in the region. “We feel confident that we will be leading the next golden decade of solar energy development,” Tim Yiu, executive director and general manager of the solar energy business of Goldpoly, a solar cell maker based in Jinjiang in China’s Fujian Province, said in the statement. The three companies plan to use modules produced with their own components, including polysilicon, wafers, cells and inverters, according to the statement. They expect to initially develop small projects and then move on to larger ones. An exact timeline and breakdown of the financing wasn’t disclosed. Lending by China Development Bank for clean energy projects exceeded $35.5 billion last year, according to a February report by Bloomberg New Energy Finance. China Development Bank has loaned to other Chinese solar power equipment makers, including more than $26 billion to LDK Solar Co., Trina Solar Ltd. (TSL), Yingli Green Energy Holding Co., Suntech Power Holdings Co. and JA Solar Holdings Co., according to data compiled by the London-based researcher. The three solar makers said this is the first time three listed Chinese companies have formed such a group, and the funding will provide a new avenue to sell their own products. Other solar companies have purchased development companies to ensure demand for their products. SunPower Corp. (SPWRA), a U.S. maker of solar panels, bought Malta-based SunRay Renewable Energy in February 2010 to increase its sales in Europe. LDK Solar bought in January a 70 percent stake in Solar Power Inc. The global marine power industry could be worth as much as 460 billion pounds ($760 billion) by 2050, with the U.K. comprising a sixth of the market, Carbon Trust said today. Power generated from the waves and tides could bring 76 billion pounds to the British economy, including 68,000 jobs created over four decades, the government-funded trust said. Those jobs would be due to growing export markets in countries such as Chile, the U.S. and European nations on the Atlantic, it said in an e-mail. Marine power costs will need to come down for the industry to grow and there is a high risk of “much smaller, or zero deployment” of the technologies, the Carbon Trust said. It costs about $396.10 to generate a megawatt-hour of power from the waves and $315.98 for tidal power, according to Bloomberg New Energy Finance. That compares with $83.20 for onshore wind, $70.07 for coal and $59.76 for natural gas. U.K. marine energy capacity could reach 27.5 gigawatts by 2050, enough to meet more than a fifth of current demand, the trust said. Globally, 240 gigawatts may be developed over the next four decades, three-quarters of that from wave power, it said. The U.K. is home to 35 of the world’s 120 to 130 companies developing wave and tidal power, according to the Carbon Trust. They include Marine Current Turbines Ltd., a Bristol-based company whose shareholders include Siemens AG (SIE), and Pelamis Wave Power Ltd. in Edinburgh.